"Clasped Hands," "Hands Together," and "Shaking Hands" are phrases used to describe the image below. 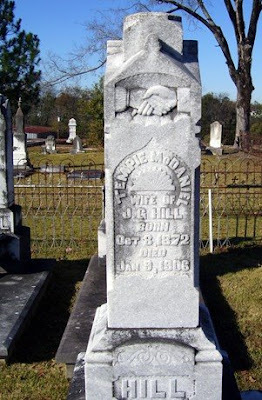 This particular image was carved into the upper part of a pedestal tombstone with a vaulted roof erected in Hillcrest Cemetery; Reynolds, GA for Tempie Hill. This symbol has a few accepted meanings. A heavenly welcome, an earthly farewell, simple unity, or friendship. If you look a little more closely, you will notice the sleeve attached to one hand is feminine, and the sleeve attached to the other hand is masculine. These hands, carved in this way, symbolize holy matrimony. I have seen the clasped hands symbol fairly often when perusing tombstones. Often enough, that I have gotten a little "used to it." I looked at this particular stone several times while at the cemetery, and I have looked at the photos I took several times more. Only when I enlarged the clasped hands image did I notice one was feminine and one was masculine. 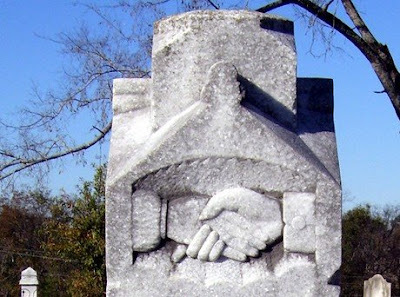 When researching tombstones, details do matter. This particular stone was easy to read. The next one might not be. Every little clue counts! Click here for more Cemetery Symbolism. I thought it was a masonic symbol, IOOF for example. actually the hand clasping above represents: symbol and devotion of husband and wife to their marriage and when one finger is pointing down it means that the life ended abruptly and they are Heaven bound leaving one behind. "[W]hen one finger is pointing down it means that the life ended abruptly and they are Heaven bound leaving one behind." >>> I did not know this part, Debbie. Thanks for the information!